At this special session for Stars At Yerkes, high school students are invited to experience life as an astronomer. While visiting the historic observatory, observing techniques will be the focus of our discussions. Students have hands on experience with telescopes, will meet with an astronomer, and be given a tour of the observatory. Students with research projects in astronomy are invited to present their work with the other students. In the evening, students will apply what they learned as they experience the dark skies at Yerkes Observatory. Students must attend the session with a chaperone (either a teacher or a parent.) Students are also recommended to come with an observing plan (specific stars and constellations.) Students may also bring their own telescopes for use during the evening session. Cost $15 (includes pizza dinner and both the afternoon and evening session) $5 if only attending the evening observing session. Click here for more information and registration. 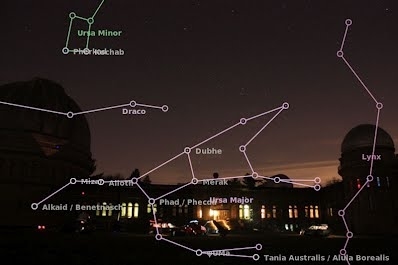 In the evening, join us for our December 1, 2012 Evening Star Party! December's dark skies feature the bright constellations of late fall and the rising constellations of winter! The moon will rise late so dark skies will reveal dramatic celestial objects such as the Pleiades, the Andromeda Galaxy, and a variety of deep sky star clusters, galaxies, and nebulae. Jupiter and its four moons will highlight your evening. You won't see Uranus and Neptune without a telescope but you just might through the telescopes of our amateur astronomers on the south lawn. Indoor activities will include a presentation in the library and family activities. This star party will happen whether the skies are clear or cloudy.